In PROXIMA we discovered ancient alien artifacts on the planet of Per Ardua - hatches that allowed us to step across light years of space as if we were stepping into another room. The universe opened up to us. Now in ULTIMA the consequences of this new freedom make themselves felt. And we discover that there are minds in the universe that are billions of years old and they have a plan for us. For some of us. But as we learn the true nature of the universe we also discover that we have countless pasts all meeting in this present and that our future is terrifyingly finite. It's time for us to fight to take back control. This is grand scale, big idea SF of the best possible sort. It is set to build on the massive success of PROXIMA and define Stephen Baxter's work going forward. Would you try another book from Stephen Baxter and/or Kyle McCarley? When you buy a Stephen Baxter book you know certain things about the plot; it will span generations and end in an astronomical catastrophe. A new technological development will enable new expansion, usually spearheaded by a billionaire philanthropist. The West will be thrown into rivalry with China; the Chinese will always be repressed statists with a penchant for heavy engineering. A Machiavellian AI has its own plans for humanity. The ending will be a let down. Ultima breaks none of these Baxterisms, and indeed seems to borrow many of them directly from his earlier books. But I wanted a moderately listenable doorstop to entertain me on long bus rides, and with Baxter that's exactly what you get (and no more). What was most disappointing about Stephen Baxter’s story? Baxter often likes to mess about with parallel worldlines, and Ultima is no exception; but here he seems to have gone for the utter laziest of possible worlds. We are first introduced to the inevitable Roman empire which never fell, which (of course) seems like a carbon-copy of the Empire of the 3rd century, despite its possession of interstellar spacecraft. Baxter has done precisely zero work extrapolating the historical, technological and social development of Rome. This gets even worse when we're later introduced to an Incan empire which never fell - an empire powerful enough to /disassemble the Moon/ into a giant space habitat but which still fights with swords and spears. Again, they appear to be a carbon-copy of the Empire of the 15th century; Baxter has done precisely zero work extrapolating the historical, technological and social development of Cuzco. Having destroyed the Earth in Proxima (those damnable Chinese!) and then the inner Solar System (the Chinese again. Baxter really is a Sinophobe), Baxter moves on to ramming the dwarf planet Ceres into Mars. The only way he can think of to top this - since all Baxter books MUST end with an astronomical catastrophe - is to destroy the Multiverse. This is accomplished via specious handwaving about "infinities being a human construct, therefore the Multiverse has an edge" and "it is statistically unlikely for humanity to not be in the middle of the Universe's life span, therefore it'll end much sooner than current physics predicts" - this is known as the Doomsday argument, and the fact that it is anthropocentric nonsense born of a misunderstanding of statistics has not prevented Baxter using it in the past, or from recycling it here with minimal effort. Ultimately, the Universe drifts into the edge of the Multiverse (rather like a sailing ship falling off the edge of the world) with little fanfare, and it comes largely as a relief. Would you listen to another book narrated by Kyle McCarley? McCarley's narration is ... odd. I'm not sure what accent he's using, or what accent he's trying for - it seems like he's attempting British Received Pronunciation and is overdoing it. This is a little distracting, but it's not ruinous - most of the time you can forget he's speaking and just listen to the book, if that makes sense. 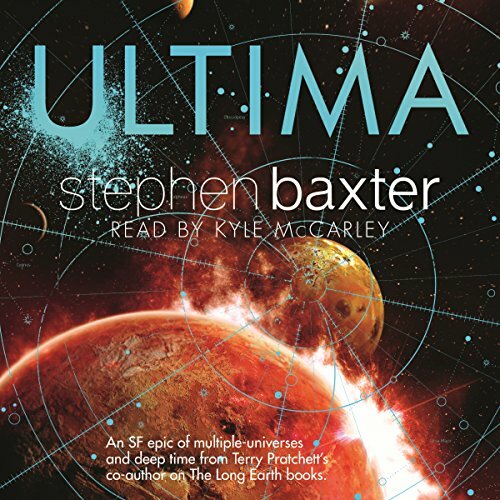 I always know what I'm getting into with a Baxter book, including the fact that it will be a disappointment; Ultima did not disappoint. It was a mildly entertaining way to distract myself on the bus. The primary draw of Ultima was its length; for one ticket you get 22 hours of mildly entertaining distraction, which - depending on how often you take the bus - can last quite a while. Würden Sie gern ein anderes Hörbuch von Stephen Baxter und/oder Kyle McCarley ausprobieren? Welcher Moment von Ultima ist Ihnen besonders im Gedächtnis geblieben? The first time a lation spoke with a fake Italian accent. Made me laugh. Then filled me with horror considering the length of the ausiobook. Würden Sie es noch mal mit einem anderen Hörbuch mit Kyle McCarley versuchen? Hat Ultima Sie zu etwas Bestimmtem inspiriert? I love Baxter. I should read the books instead of listening to them I guess. "Proxima", the first part of the story, is different (and I found it much more entertaining).